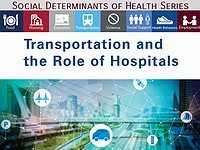 “Transportation and the Role of Hospitals” is part of a series of guides and resources released by the AHA, HRET and ACHI on how hospitals and health systems can address the social determinants of health. What are transportation issues that affect patients? Each year, 3.6 million people in the United States do not obtain medical care due to transportation issues. Transportation issues include lack of vehicle access, inadequate infrastructure, long distances and lengthy times to reach needed services, transportation costs and adverse policies that affect travel. Transportation challenges affect rural and urban communities. How is transportation related to health? Because transportation touches many aspects of a person’s life, adequate and reliable transportation services are fundamental to healthy communities. Transportation issues can affect a person’s access to health care services. These issues may result in missed or delayed health care appointments, increased health expenditures and overall poorer health outcomes. Transportation also can be a vehicle for wellness. Developing affordable and appropriate transportation options, walkable communities, bike lanes, bike-share programs and other healthy transit options can help boost health. This guide outlines transportation issues and the impact on health and health care access. What is the role of hospitals in addressing transportation issues? Multiple strategies may need to be employed to reduce transportation gaps for patients. This guide discusses the role of hospitals and health systems and recommends strategies for addressing transportation issues, including screening and evaluating patients’ transportation needs and providing transportation services through community partnerships or programs. The guide includes four case studies on hospitals and health systems and their interventions to reduce transportation barriers in their communities. View an archive of the webinar Transportation and the Role of Hospitals. See all available resources and upcoming topics social determinants of health series.